After getting frustrated with how spread out and unmanageable my pedals were for recording, think I finally found a solution. Can post details if anyone is interested. That's interresting also for desktop synth, do you have a reference to share ? Then I purchased some VESA-compatible keyboard/laptop stands. The square ones are laptop stands (https://www.amazon.com/gp/product/B00Z1VBIE0) $20, the long skinny one is a keyboard stand (https://www.amazon.com/gp/product/B01CF5V29U) $20. These then just mount on the monitor stand. The keyboard tray has two minor issues. First, it's a little flimsy, so I wouldn't pound on the switches of pedals sitting on it. It won't break, but it does bend. The second issue, which is more annoying, is that the mounting holes are slightly too small to fit the brackets supplied with the monitor stand. Both manufacturers claim they're using standards, but in the end I just used a drill very slightly widen the mounting holes and it works fine. The notebook platform's only issue is that the lip at the bottom doesn't run full length, so pedals may slide off. You could use velcro, put on some self-adhesive bumpers, or just rely on the audio cables to keep them on if they're tipped too far. In the pic I have a Strymon Ojai powering most of the pedals, but I'm picking up a Strymon Zuma which has more outputs and also two dedicated 12/18V outputs that can be used to drive a couple of my 12V pedals (thus saving on outlets). It's about $150 maybe 1.5 hours of work to put together, most of which is just screwing things together and drilling out the holes in the keyboard trays. On the very bottom is a tilting laptop holder. That gives me a final bottom tier with some clearance underneath. And yes, this would work fine for desktop synths. 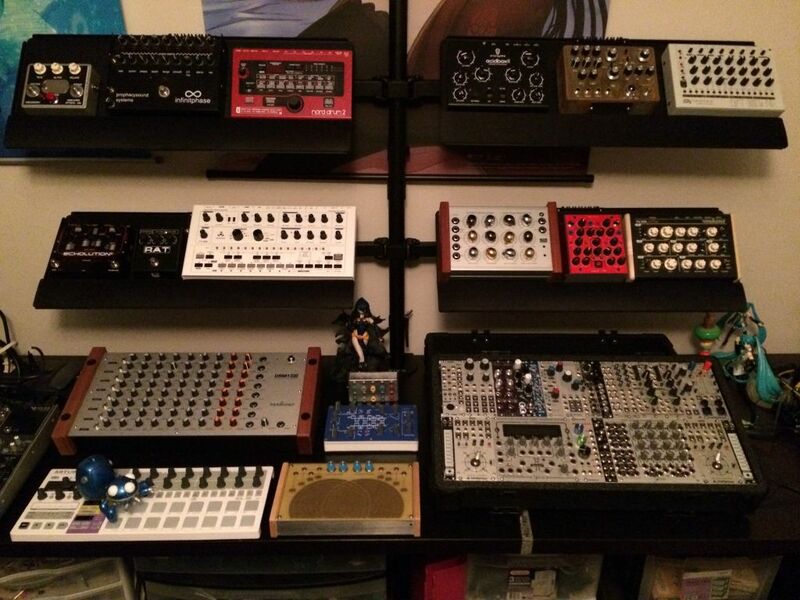 You can see a related setup in the background with Blofeld, Machinedrum, etc. Larger desktop synths (Modor NF-1) may not fit. The Cirklon is also on a notebook attachment for the K&M stand. 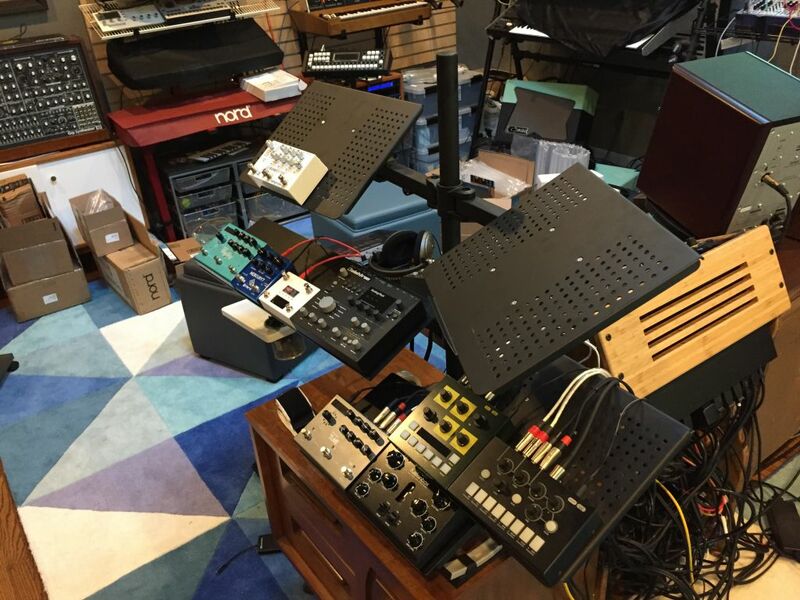 Oh, and the reason not to just have 4 keyboard stands -- they'll end up touching, limiting the degree to which you can angle them, and they'll also end up being about 5' total, which is more than I could spare. I have another keyboard surface coming in which will replace the notebook one on the top right, which is a nice compromise. Funny i have the same setup but i splitted the arm 2x2 on each side of my desk. Oh that's a great solution, thanks! I really dislike having my gear spread out around the room - I find I just don't use it unless it's within arms length, so I reckon I'll give this a try. Stuff is spread out everywhere in my studio so I can't really get an optimal solution, but this solves a density issue (pedals on a single flat surface will sprawl), it's more ergonomic (higher up so less bending over), and since these are all tied into aux busses, I tend to get a track going and then walk over there and adjust the bits I care about to taste. Nice. I can imagine integrating a patchbay or matrix mixer would be great. Not sure what you mean? I'm using a MOTU AVB setup which is the ultimate matrix mixer for the sheer # of effects I have in play. Between my 1248 and 16M I 12 stereo sends/returns, and if I need more I'll add another 16M. Routing via Web interface is a dream. I decided against an SSL Matrix just because it didn't have enough expansion. The iPad app makes it super easy, or a laptop. It's still otb in my book, I'm just using a digital interface to quickly patch and set sends, which is easier than walking to a console or pulling cables. thanks for posting the details...i'm going to build two of these! How is that Erica Fusion Box? I know they are new, but I have been lusting. Haven't had much time to play with it. It gets wild really fast and has a narrow sweet spot if you want subtle. I think advertising it as a chorus flange ensemble may lead to disappointment (e.g. Comparing to a cluster flux). just set mine up today! i went with different keyboard shelves since you said the ones you got were a bit flimsy. WAY more room for more noiz weapons. Which shelf did you use? Perhaps a 4MS Bend Matrix might fit the bill. Midi controlled routing of your pedals and other weird stuff. It's not Euro at all. link to which parts you used? Woe! This is really impressive! Aye, that looks ace. Would suit me perfectly. Have barely touched my pedals since completely running out of desk space, expanding vertically in this manner is the way!